Until the second quarter last year US inflation expectations had been a very helpful leading indicator of equity prices. The second quarter 2005 was also when Mr Bernanke nosed in front of Glenn Hubbard and Martin Feldstein as favourite to succeed as Federal Reserve Chairman. He came as a man supporting implementation of an inflation target. 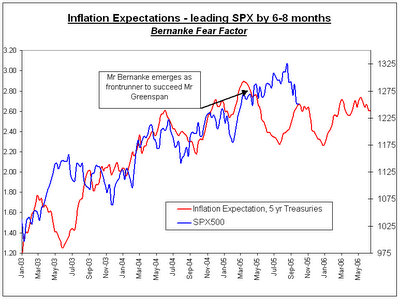 Coincidentally or not, inflation expectations fell as he became more likely to replace Mr Greenspan (Exhibit A). Yet the Chairman is not, he says, an "inflation nutter" (a Mervyn King phrase): he wants an inflation target harnessed to a policy of "constrained discretion". This would avoid, for example, killing growth as the cost of dogmatically taming prices. Exhibit A: Bernanke Fear Factor? Yet it is how unconstrained discretion would be in a targeted regime that intrigues. Belatedly, many equity investors have sold hard, erring on the side of caution by assuming at least some maniacal anti-inflation tendencies on the part of Chairman Bernanke. Are they right? Rate rises impact two years hence. Given that US rates began increasing timidly in July 2004, continued rises in short-term core and non-core US inflation are probable in a persistently expensive energy context. If Mr Bernanke's target is the often referred to core rate of 2% the hard landing scenario of overshooting rate rises is alive and well. Some economists are even increasing the volume on the stagflation thesis.